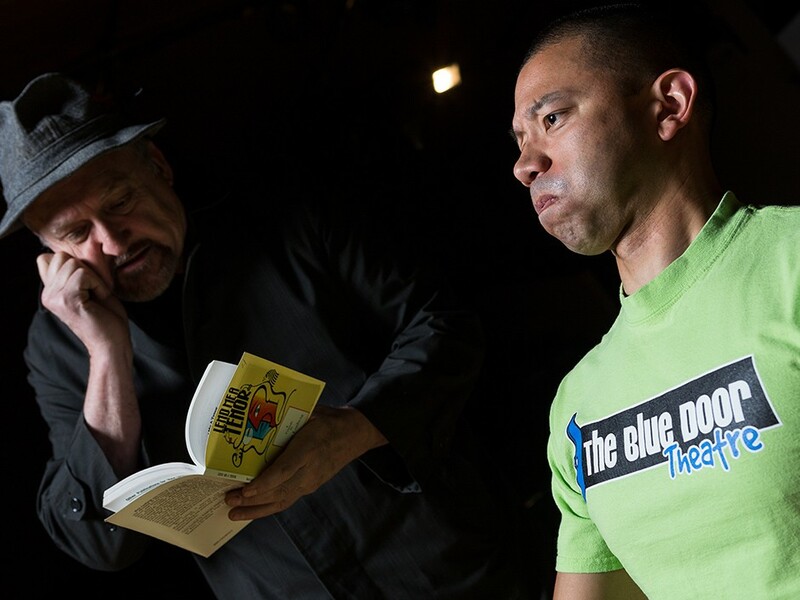 Frank Tano (right), director of Blue Door Theatre, is set to improvise off Interplayers\' Jamie Flanery. Back in March, as Frank Tano watched Speech and Debate at Interplayers, he witnessed a café scene in which a mug filled with water was accidentally spilled. His incredulity makes sense, given that Tano is the artistic director at Blue Door Theatre, the region’s most established improv venue. Though he enjoys and admires the performance of scripted material, he also finds it easy to spot its shortcomings. Like glossing over lines recited out of sequence. Or ignoring spilled water. The very nature of improv is spontaneous. But it’s a spontaneity that takes practice. In one trial run for ReMix (the texts used on the night will remain a secret to the improvisers), there occurred what Tano describes as “synchronicity moments” — points where “things just sort of click. “As the other actor was talking about how someone is turning blue, I decided I was going to hold my breath. They were referring to somebody else, but because of the way the scene was, it was now me,” he says. And that synchronicity happens more often than you think. Tano compares it to another short-form improv game that invites audience members to write phrases on paper, which are then randomly pulled out of a hat. The Blue Door players are never sure what will be drawn, especially if the audience is in an inventive mood, but there are many times when the action and phrases mesh so well they might have been paired from the start. Tano names himself as one Blue Door actor who falls short when it comes to memorizing lines. Along with the inability to keep himself from reacting to spilled drinks and his urge to “explore what’s in the next room,” it’s just one more reason why he opted for improv. During ReMix, those theatrical liabilities will become comedic assets — if they can pull it off. “They’re excited, we’re excited, so we’ll just see how it works,” says Tano.